The author, Dr. Kimata, is also backing up steroid withdrawal. He is an academic person who has published many papers written in English. This paper compares the severity of the rebound phenomenon, IgE and other values after topical steroid discontinuation between the suplatast tosilate (antiallergic oral drug with the commercial name of IPD)-administered group and the control group. The above table shows the profile of patients, who are properly allocated. He examined lgE and other immunoglobulins of the blood taken 2 weeks after the topical steroid discontinuation. At this point, the rebound phenomenon was seen in all of the control subjects (15) and in only 2 out of 17 IPD-administered subjects. Rebound evading effects of antiallergic/antihistamine drugs such as IPD will be discussed in another chapter. What I want to stress here is that there is a clinical way to evade or alleviate the addiction and rebound, as far as they are mild in condition. Let’s look at the blood examination results. I appreciate Dr. Kimata for having presented the specific data concerning cytokine storm-like lgE increase after topical steroid withdrawal. It is difficult to find the paper with data for patients in the midst of rebound. In the control group (which can be called “the rebound group”), IgE and IgG4 increased. As to cytokines, Th2 cytokines such as IL-4, IL-5, IL-10, and IL-13 increased, whereas Th1 cytokines such as IL-2 and IFN-γ remained almost the same. Such very clear data are shown in the above table. Why are Th2 responses enhanced to cause cytokine storm-like conditions during the rebound phase, then? The following study clearly explains this mechanism looking at Langerhans cells while maintaining compatibility with Dr. Cork’s theory. The skin barrier, atopic dermatitis and allergy: a role for Langerhans cells? The above figure (a) illustrates the normal skin conditions warding off allergens. Figure (b) shows injured stratum corneum. The langerhans cell captures allergens penetrating into the skin and conveys the information to the lymph node. Such information is received by Th2 cells in the lymph node. 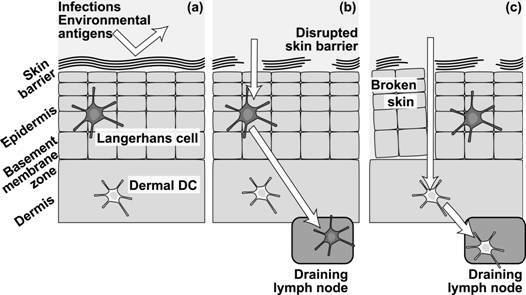 In Figure (c), the completely disrupted epidermis has allowed allergen penetration into the dermis and antigen presenting cell in the dermis (monocyte-macrophage) receives and convey the information to the responsible lymph node. In this cas the information is transmitted to Th1 cells. According to Dr. Cork, corneodesmosomes in the stratum corneum are disrupted by proteases in the rebound phase after topical corticosteroid discontinuation, which corresponds to the above figure (b). When corticosteroids are discontinued after a prolonged use on the whole body, Langerhans cells, which have been suppressed by steroids, abruptly flow into the lymph nodes to activate Th2 cells, which will naturally increase IgE and IgG4 levels sharply like a cytokine storm. Any dermatologist should know of the scratch patch test and might have performed it at least once. Patients with contact dermatitis or drug exanthema who have negative responses on the usual patch test may show positive responses on the patch test conducted with the stratum corneum slightly damaged. Systemic erythroderma observed in rebound patients is likened to performing the scratch patch test on the whole body. Why is the Th2-dominent immunity maintained with IgE production especially enhanced differing from the usual contact dermatitis that resides shifting to Th1 immunity at an earlier stage? I expect this may relate to the molecular weight of allergens. Environmental allergens such as house dusts with high molecular weight might be captured by Langerhans cells before reaching the dermis, only to be sent to Th2 cells. Whereas, metal allergens or simple chemical substance with low molecular weight may easily dodge Langerhans cells to reach the dermis, which will result in switch to Th1.